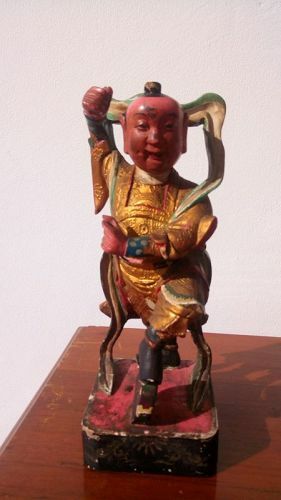 A polychrome wooden antique statue of the Chinese God NAJA, 19th Century. Condition good, hand-held items missing. Size: H. 31 cm x W. 11.5 cm x D. 11.5 cm. 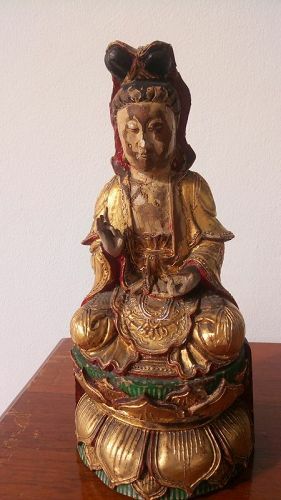 An antique Wooden Chinese Statue of GUANYIN sitting on a double Lotus Throne, with guilding and paint. Condition: good with slight signs of aging, 19th Century. Size: H. 28 cm x W. 13 cm x D. 11 cm. 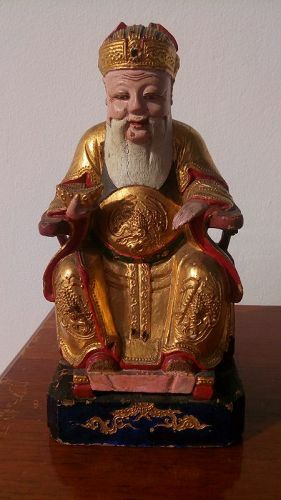 A late 19th Century Wooden Chinese Statue of the God of Wealth/CAISHEN with guilding and polychrome paint. Very good condition Size: H. 24 cm x W. 11.5 cm x D. 10.5 cm. 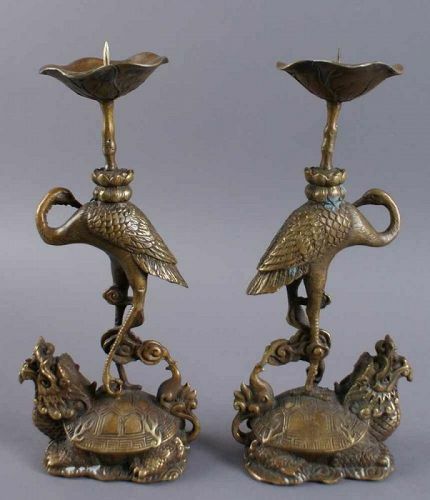 A unusual Pair of Chinese Bronze Candlesticks, each depicting a Crane standing on a Dragonturtle. 19th Century. Good condition. Size: 28 cm. each (11"). 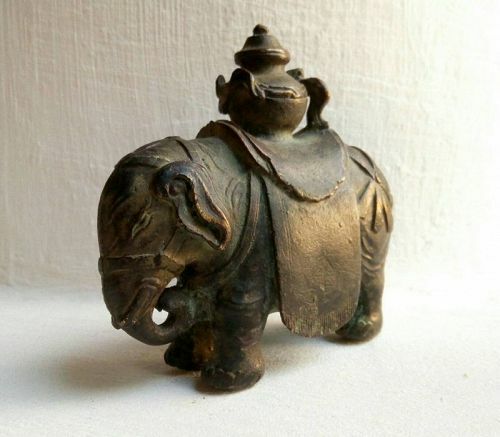 A rare and very nice QING DYNASTY BRONZE ELEPHANT WITH CEREMONIAL VESSEL, elaborate trimmings, saddle and typical Chinese stylized eyes. Overall very good condition, bottom of saddle on one side has an inconsequential very small piece missing. Naturally formed dark patina. Size: L. 9.5 cm. x H. 9 cm. x W. 3.2 cm. Weight: 342 gr. Provenance: Private Collection. 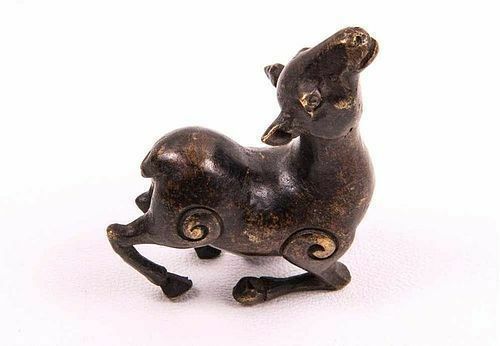 A rare lost-wax SOLID BRONZE FAWN, most likely Tang Dynasty, fine naturally formed Patina. Good condition. Size: H. 6 cm. x L. 5 cm. Weight: 113 gr. 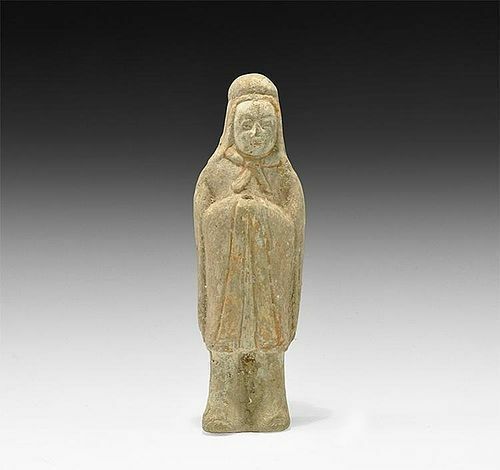 A very serene and spiritual QING DYNASTY Polychrome Wooden LOHON MONK in adoration, standing on a LOTUS Base. 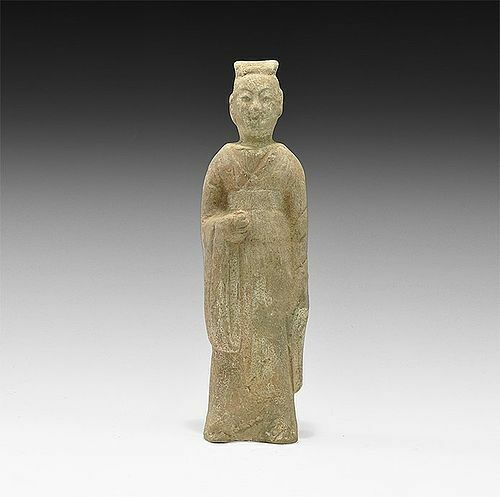 Rare piece and good size: H. 73 cm. (~ 29" inches). Good condition overall, with some signs of aging. Has good Aura and seldom found! 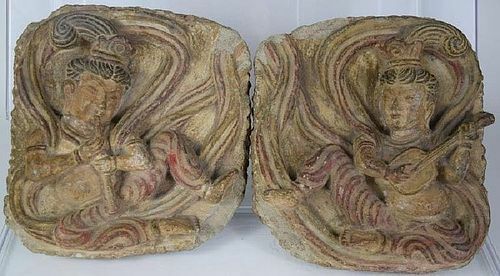 A very rare set of 2 ancient Chinese Stone Carvings depicting Musicians with excellent detailed sculpture. 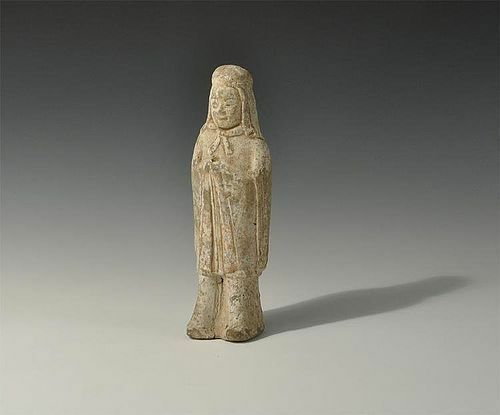 10-12th Century A.D. Good condition. Size: 7.5" x 7.5" x 1.75". Provenance: ex-Collection of famed H. MEDILL SARKISIAN (1909-1993), Denver, Colorado. 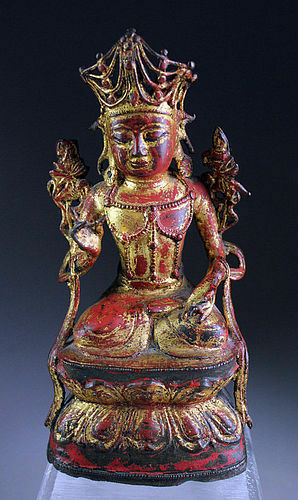 AN EARLY MING DYNASTY BRONZE GWAN-YIN/KWAN-IM STATUE WITH BEAUTIFUL RED AND GOLD PATINA, (1368-1644). She is wearing a Tiara and is seated on a raised Lotus Throne with Flowers. Good overall condition. Size: 18.5 cm. Very fine Collector's Piece! Provenance: Private Scandinavian Collection. 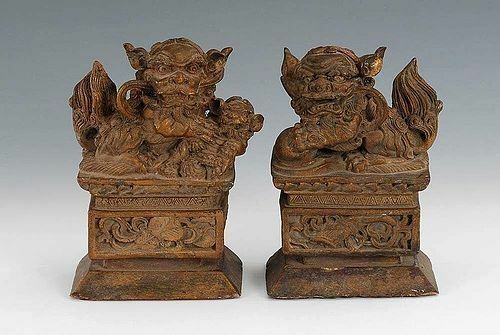 FINE PAIR OF ANTIQUE CHINESE WOODEN FOO-DOGS/LIONS, 19TH CENT. 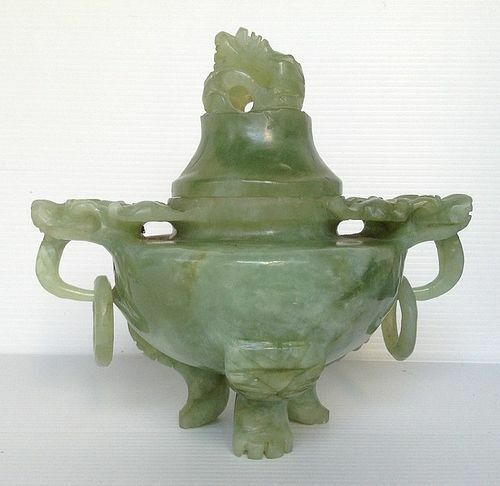 A finely carved Green Jadeite Jade dome lidded Tripod Censer with handles, animal heads and loops as well as a foo lion on the top cover which is removable. Condition: good overall. Size: 13 cm. diameter (5.25"). 19th Century. Nice quality/colour Jade! 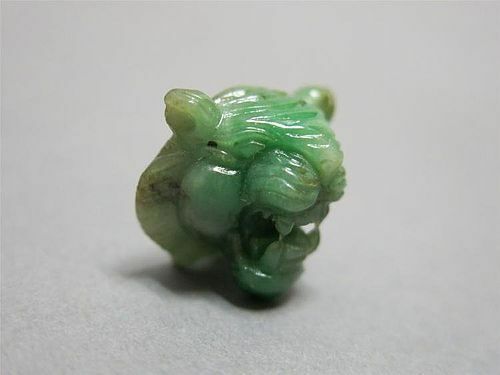 A fine and rare APPLE-GREEN CARVED CHINESE JADEITE TIGER HEAD, ideal to design and create a sensational and precious Jewelry Piece! Very good condition. Provenance: from a Private Antique Collection. Size: L. 2.5 cm x W. 2.0 cm. UNIQUE! 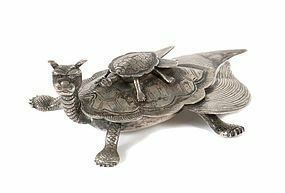 A Silver Dragon Turtle carrying a baby on it's back, 19th Century, China. From the estate of a collector. L. 9 cm. 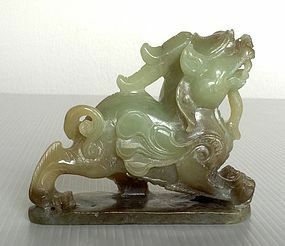 A rare and finely carved Chinese Celadon Green JADE CHIMERA, 18/19th Century. Intricately detailed work with beautiful stylized wings. Very good condition, no repairs. Provenance: from an important Washington D.C. diplomatic estate. Size: 7.5 cm. (3"), 185 gr. 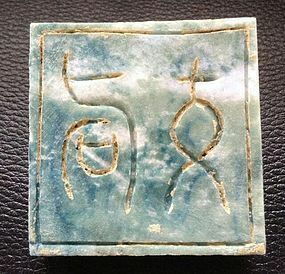 Ancient Square Chinese Seal Chop made of blueish-white jade stone with calcification and with a finely carved auspicious 3-legged money toad on top. Good condition, no restorations or chips whatsoever. Size: 6 cm.x 6 cm. x H. 4 cm.